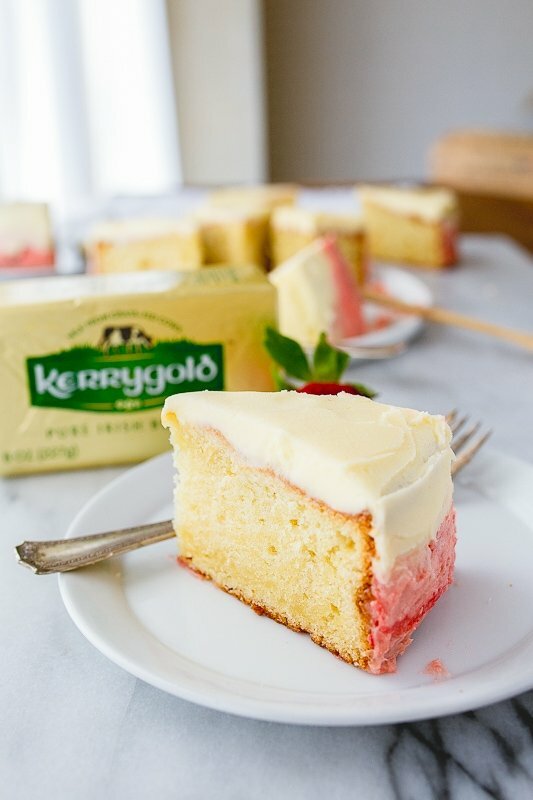 Mini ombre cake: this post is sponsored by Kerrygold. In the pursuit of cuteness, I made us a mini ombre cake. If you’re new to the word ‘ombre,’ you’ve been spared horrible hair dye jobs (lucky you!). Ombre is when a color fades from dark to light. In this case, dark pink frosting on the bottom of the cake fades to a plain white vanilla buttercream on top. Are you with me? Doing an ombre job on a mini cake was, um, challenging. Our little 6″ cakes only bake up to be about 2″ high, so how much room do we really have to get our ombré on? 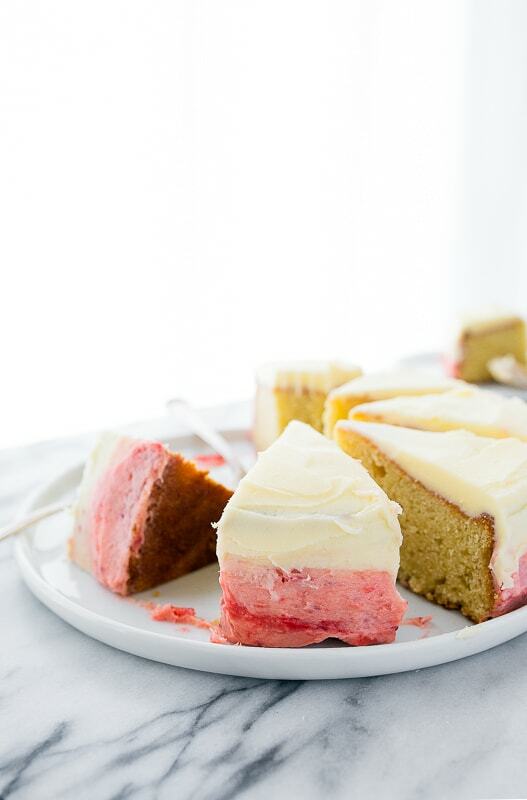 But we persevere and swirl a little strawberry jam into our icing with big mini ombre cake dreams. Before we get too far, let’s talk about mini cake pans. I have always used a 6″ cake pan with 2″ high sides. This is the exact pan I use. Last year, I started seeing 6″ cake pan with 3″ sides. Don’t buy those! The extra inch of pan will create more heat in the oven and make your cake sink. (And nothing makes me sadder than sunken cakes). Speaking of, I just created a new SHOP so you can peep exactly which bakeware I use when making small batch desserts. I’m really excited to share it with you! I should confess, I made this cake for another reason. My site was lacking a mini vanilla cake recipe. I mean, can you freaking believe that? Seven (SEVEN) years of blogging, and I’ve never posted a vanilla cake recipe. And vanilla is my flavor of choice, ahead of chocolate. 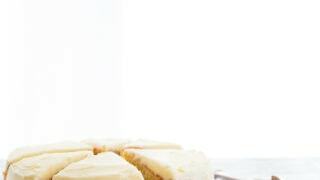 I should mention that my cookbook, Sweet & Simple has a very vanilla cake in it, and I very much love it. But this one went a slightly different direction without vanilla bean…and with strawberry jam. 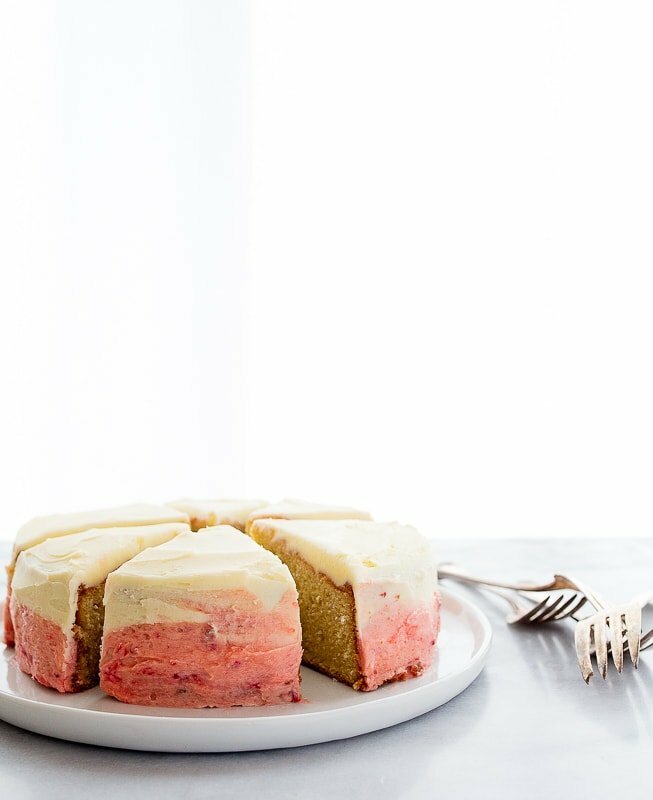 If you’re looking at this mini ombre cake and thinking the vanilla icing part looks a little yellow, it’s because I used my favorite Kerrygold butter. It’s a richer yellow color than regular butter, and tends to dye my frostings a bit yellow. I’m not complaining one bit, because you know how I love my Kerrygold. 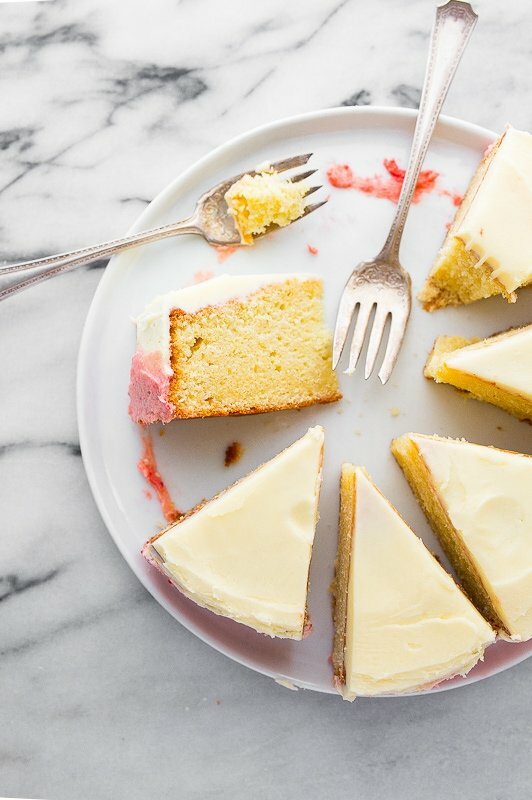 This mini cake recipe makes 6 mini slices of cake, or 4 bigger slices. Personally, I can eat a quarter of this cake at a time without any hesitations. I won’t hedge any bets about how many slices you can eat a time. That’s between you and your fork, no one else. I’m auditioning cakes for Camille’s second birthday in May, and you better believe this one just landed on the top of the list. Though, I’d have to use blackberry jam instead of strawberry jam for her, because purple is her favorite color. Regardless, cake testing for a little girl’s birthday party is my favorite part of being a Mom so far. But you guys don’t really think I’ll give her a cake made with real sugar, do you? You know how I am. (See: maple syrup cupcakes, heh). Preheat the oven to 350° and grease a 6” round cake pan with 2" sides. Line the bottom with a round of parchment paper. In a medium bowl, beat together with an electric mixer the butter, sugar, and vanilla. Beat very well, about 1-2 minutes. Add the egg and beat until well combined, about 15 seconds. In a small bowl, whisk together the flour, salt and baking soda. Add half of this to the batter and beat lightly. Stir in the milk and continue beating. Add the remaining dry ingredients and beat, then stir in the sour cream. Scrap the batter into the pan, smoothing the top and bake on a small sheet pan for 37-39 minutes, until a skewer inserted comes out clean. Let cool on a wire rack in the pan. Carefully remove the cake by running a knife around the edge of the pan. The bottom should come free easily, since it was lined with parchment. Next, make the buttercream: in a medium bowl, beat the butter with an electric mixer until light and fluffy. Add the powdered sugar and milk and beat until combined. In a small bowl, add the strawberry jam, and stir in a scoop of the buttercream, about a 1/2 cup. Mix very well until combined. If its not red enough for you, add red food coloring. If the jam causes the buttercream to be too loose and floppy, refrigerate it for an hour. (It really depends on your jam, I used homemade strawberry jam that was quite runny, and had to refrigerate before decorating my cake). Place the cake on a serving plate. 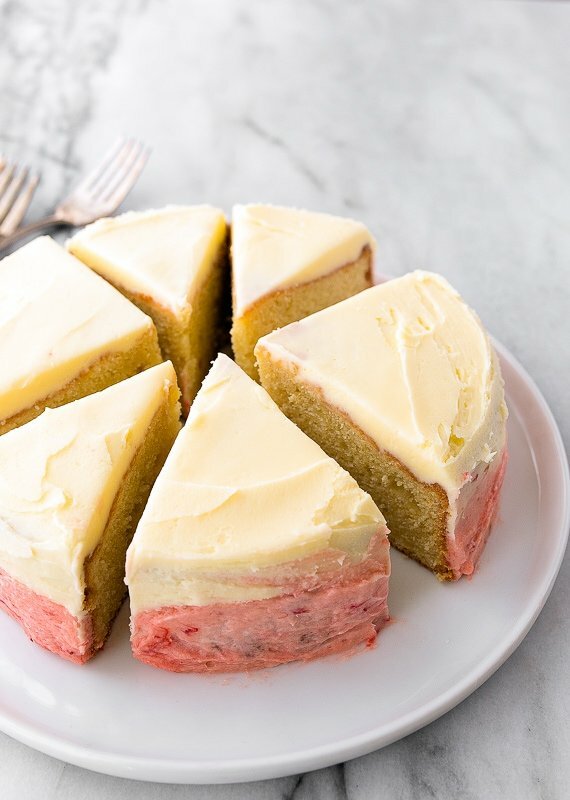 Using a small spatula, spread the strawberry frosting along the bottom edge of the cake. Next, spread the remaining (white) frosting on top of the cake, pushing it down the sides as you go. 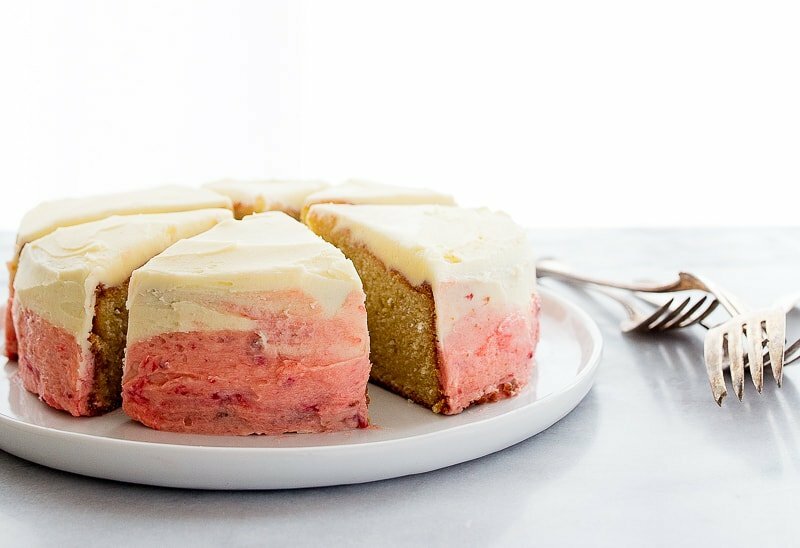 Using the spatula, smooth the sides of the cake and blend the white and pink frosting together. Pretty! *Since this cake is made with butter, it will dry out quickly if left uncovered. Either serve immediately, or cover tightly in plastic wrap. The frosting will help keep it moist for a few hours, though. This looks so delicious and cute! omigosh cuteness mission accomplished! This looks amazing and I love that you’re hunting for the perfect 2nd birthday cake for Camille! This cake looks so simple and pretty! The frosting looks delicious with the jam swirled in – love that idea! The store is such a great idea! I love all of the things listed and now have a very full cart in Amazon. I’m so tempted by the mini Kitchen Aid!! I didn’t even know there was such a thing. So cute! I was so glad to find your site. As a widow it is hard to make desserts for 1-2 . I’ve made a few 6″ cakes. I will most surely try this new cake, strawberry frosting, yum. How can I make this cake more moist. It was dry. Love it and might try it with vanilla bean paste cause I love the flecks of vanilla in the cake. Love that it’s 6″ too! hey girl- this looks delish! Made this and shipped it to my daughter in college for her birthday. She reported it was wonderful! Now that she’s coming home for summer (in a few weeks) she asked if I could make her a coconut version? The 6 inch would be great because I think she and I are the only ones who like coconut. I thought I might make this cake again and find a coconut frosting? Plus I really want to taste it myself! has anyone tried to double the recipe? I would like to make two 6″ cake and layer them. if i double the ingredients will it alter the recipe, or should i just make two batches? Made this awesome little cake tonight for my hubby and I it is yummy! I am debating between this cake and your mini vanilla cake, what’s the difference in terms of taste? Would the ombre work with other fruit jam?